Led by Aroldis Chapman, the Yankees’ bullpen became the first relief unit to strike out more than 11 batters per nine innings for a season. This Major League Baseball postseason, and in particular this wild-card round, might represent a tipping point in pitching strategy. Relievers accounted for a record 17,415⅓ innings this season, topping the record set last year of 16,469⅔ innings. Major league relievers accounted for 40.1 percent of total innings thrown this season, a record share of workload. And bullpens have taken on an even greater share of work in recent postseasons. 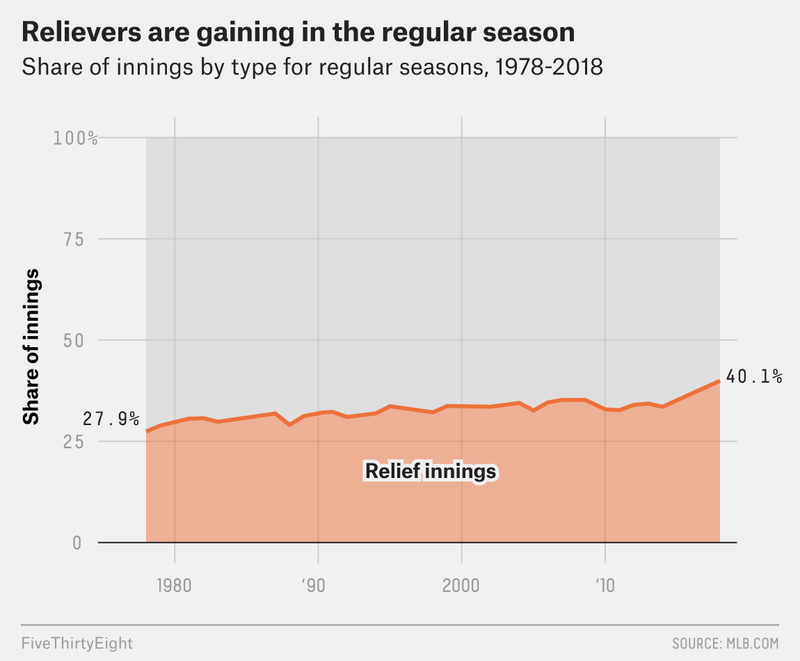 Relievers threw a then-record 38.1 percent of regular-season innings last season, but in the postseason, that share of work jumped to 46.5 percent of innings. For comparison, bullpens in 2010 accounted for 32.9 of regular-season innings and 32.3 percent of postseason innings. 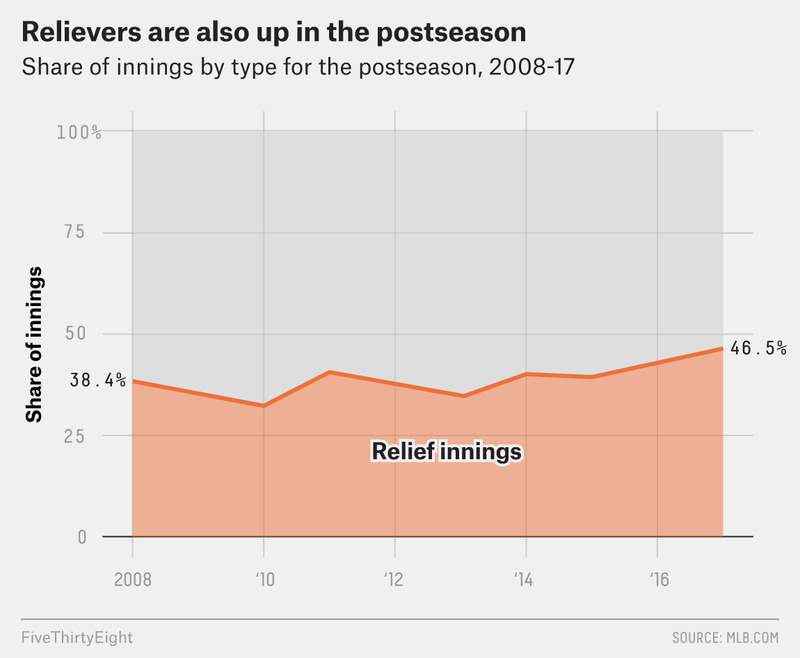 The end game — the bullpen, the relief corps — is increasingly front-and-center in baseball, particularly in the postseason. With the game turning more to bullpens, no situation calls for consideration of a bullpen-style approach more than the urgency-filled wild-card games this week. The New York Yankees and Oakland A’s are built to pitch largely from their bullpens when they begin the American League playoffs Wednesday, as the teams respectively rank first and fifth in the majors in relief wins above replacement. The Yankees set an MLB record for strikeout rate by a bullpen last season and shattered their own mark this season, becoming the first relief corps to strike out more than 11 batters per nine innings for a season. Their 9.7 WAR total is also an MLB record. The Yankees and A’s are each considering “bullpenning” the game, a strategy in which a traditional starting pitcher does not go deep into a game, or even start the game, and the majority of innings are absorbed by relievers or starters in brief appearances. While the Yankees have an ace in Luis Severino, another penalty for not winning a division is that teams are often faced with expending their best starting pitcher in the wild-card game. But allowing a No. 1 starter to work the majority of a wild-card game limits his total impact in the following series, should the team advance. Bullpenning the wild-card game allows for a team to rest its best starting pitcher or use him in limited fashion. Nearly a year to the day after former Yankee manager Joe Girardi said he was uncomfortable with bullpenning a playoff game (Severino’s struggles prompted an early call to the bullpen anyway), first-year Yankee manager Aaron Boone said last week that he will “absolutely” consider a bullpen-heavy approach. The A’s almost have to get the majority of their innings from their bullpen Wednesday. Oakland has the thinnest starting staff of any team in the postseason, a group decimated by injuries. Ace Sean Manaea is on the disabled list, as are starting pitchers Jharel Cotton, Daniel Gossett and Kendall Graveman. Oakland’s best remaining starters are Trevor Cahill, Mike Fiers and Edwin Jackson. But the A’s do have one of the most dominant relievers in the game in Blake Treinen, who has a 0.78 ERA, and they strengthened their bullpen at the trade deadline with the acquisitions of Jeurys Familia and Fernando Rodney. Only the Tampa Bay Rays, who routinely started games with relievers — or “openers” — saw their starters average fewer pitches per start (63) than Oakland (81) this season. Of the AL playoff teams, the relievers of the Astros, Yankees, Red Sox and A’s — all but the Indians — limited opponents to a lower on-base percentage plus slugging in their first plate appearance in a game than starters did to opponents in their second plate appearance. In the NL, the Brewers and Cubs also might want to think about going to their bullpen before some of their starting pitchers face an opposing lineup a second time. Bullpenning might be an even more powerful force in the National League playoffs. Wild-card rosters can be manipulated to carry more position players. By pinch-hitting for the pitcher spot regularly in a game, an NL-bullpenning team can add a de facto designated hitter to its lineup. The Brewers’ bullpen enters the postseason on a tear. After winning a tiebreaker game Monday against the Cubs to avoid the NL wild-card game, Milwaukee will likely rely heavily on its bullpen in the NL Division Series round. The Brewers employed a “bullpen day” recently and have the NL’s most valuable reliever per WAR in Josh Hader (2.9), who entered Monday second to the Yankees’ Aroldis Chapman in the majors in strikeouts per nine innings with 15.9. 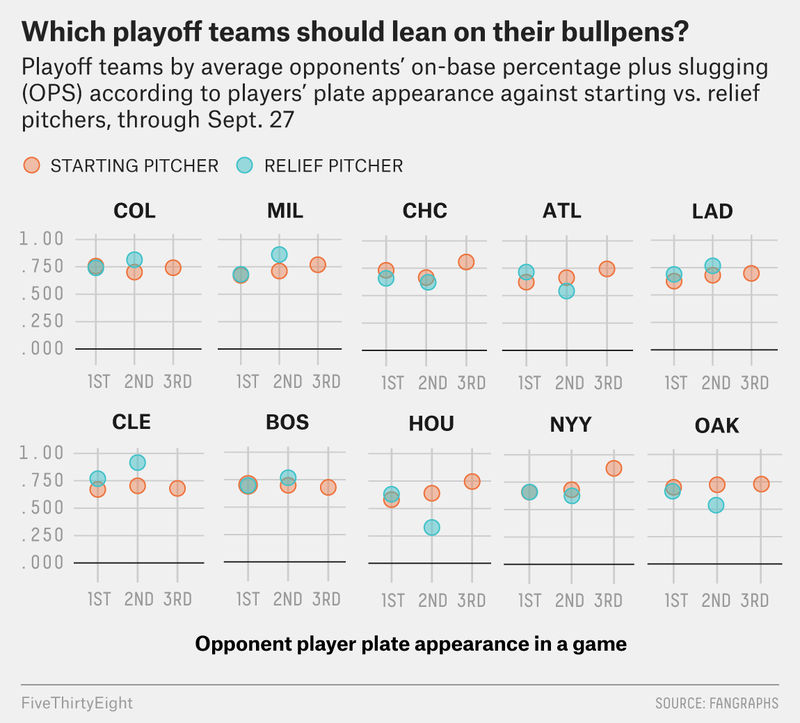 Nearly every team in the postseason has placed a premium on bullpen help with an eye on regular and postseason play. Never have teams more valued relief pitchers — the position group was one of the few player demographics unaffected by last offseason’s ice cold free agent market. The Rockies committed $106 million to free agent relievers last winter — and that was before Adam Ottavino became one of the best relievers in baseball this season, remaking himself in a vacant Manhattan storefront. The Indians gave up their best prospect, Francisco Mejia, in a deadline deal with San Diego to acquire relievers Brad Hand and Adam Cimber. The defending champion Astros trail only the Yankees and San Diego Padres in relief WAR (8.2) and posted the lowest bullpen ERA (3.03) in baseball this season. Yankees GM Brian Cashman built a super bullpen before the 2017 trade deadline and added Baltimore relief ace Zach Britton prior to this deadline. Relievers could throw as many or more innings as starters in the postseason this fall. While there are still 27 outs necessary to record a win, the way to optimize run prevention has been turned upside down.